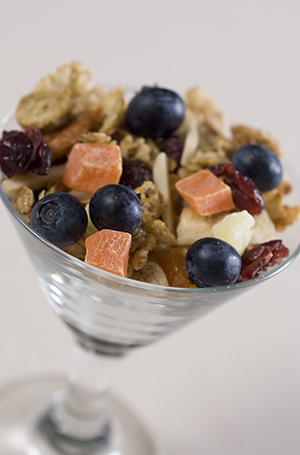 One of the most requested recipes at the inn, our granola is easy to make and allows you to personalize it with your favorite fruits and nuts. Our maple syrup comes from right here in Jackson, but we realize you may have to compromise and use syrup from ‘away’ -but it will taste almost as good! Melt butter and add canola oil and maple syrup (or honey if you prefer). Mix dry cereals together, then gently mix in maple syrup mixture using a rubber spatula. Use up to 2 1/2 cups of syrup if a sweeter granola is preferred. Spray cookie sheets with non-stick cooking spray and spread cereal mixture in a thin layer on the cookie sheets. Bake in 250 F. oven for one hour, stirring well every 20 minutes. Cool slightly, then mix in the nuts and your choice or dried fruits such as golden raisins, dark raisins or currants, diced apricots, diced pineapple, dried cranberries, dried blueberries or cherries, diced papaya, dried banana chips, etc. Store in tightly sealed container. Serve with fresh fruit and yogurt if desired.